Winter is here once more, and with it comes an age old reverence for seasonal traditions. In the United States, for many this includes stringing up multicolored lights, kissing beneath the mistletoe and singing carols with friends and family. And for atheists, winter means it's time to declare to our annual War on Christmas! Unfortunately, there are many out there who wish to see an end to our beloved tradition. Why, it seems lately that one cannot even punch a snowman in the face without inspiring the ire of right-wing pundits! Surely, my fellow atheists, you have heard the accusations spouted by these believing men and women? They claim we are empty inside, and that we lack something meaningful! Usually, I scoff at this notion, but lately, I've begun to think they are right. But what do the religious have that we lack? I put forth that what we are missing is a figure that represents the meaning of the season for us. Christians have Santa Claus, and to a lesser extent, Jesus. But what do atheists have? Nothing! Perhaps, it's time atheists adopt a Christmas figure that shared in our particular seasonal proclivities, and this is why I nominate Krampus to be our official Yuletide Mascot! According to some religious conservatives, atheists have their hearts set on ruining Christmas for everyone. 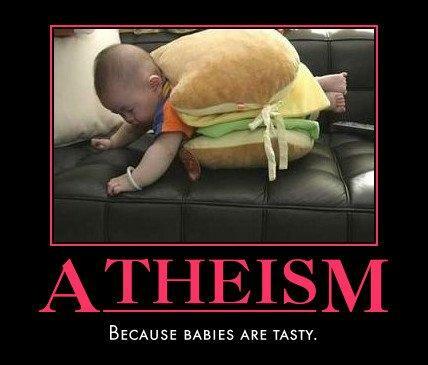 Its common knowledge that atheists have a fondness for devouring the flesh of helpless babies. Krampus, although practically unheard of Stateside, remains a Christmas staple in the Alpine countryside. He is usually represented as a grotesque, fur-laden, goat humanoid with a large menacing tongue. Typically, he functions as a foil for Santa Claus. While Santa Claus rewards well-behaved children with gifts and Christmas joy, Krampus beats the naughty ones with chains and sticks, throws them in his sack, and takes them into his lair to gobble them up. So, we have the eating of children down, and I don't know about you, but I think being beaten with chains and eaten is a really good way to put a damper on one's holiday. Truly this is a perfect match! Originally, Krampus had just the one day. A few men in each town dress up in furs, heavy boots, and a ghoulish mask topped with horns—with a switch in hand. Then they go to all the houses with small children, and when the parents open the door they run in and act menacing—growling and cracking their switches. The children scream...Not surprisingly, by the end of the night the Krampuses’ growls are a little slurred, their switch-cracking is a little too close to the children. The festivities proved so likable that it was stretched out to include the entire weekend: “thus was born the Krampusfest—or, as it is known in southeast Austria, the Kränchen.” To sum it up, Krampusfest has now become "a beloved excuse for small towns to get together and drink their brains out." As Americans, I think we have an obligation to keep in tune with our national pastime: over doing things to the point of vulgarity. I propose that we celebrate Krampusfest here in the States for the entire month of December! What better way to celebrate the Holiday Season than to partake in drunken debauchery and the traumatization of small children? For those of you who are now boiling with enthusiasm for everything Krampus, I recommend the following videos (featured below) to help you become better acquainted with the lovable scamp. The first is a short animated clip from Celebrity Chef Anthony Bourdain, entitled A Krampus Carol; it features Krampus doling out punishment to a pair of misbehaved youngsters. The second video is from Rebecca Watson’s lecture at Skepticon 3. She not only speaks on Krampus, but includes talk of the Icelandic Yule Lads and "murderous feline fashion police." (The parts relevant to our topic are between the 25-33 minute marks, the video will start at 25:00). Tired of the high price at the pump? Check out these electric scooters; X-Treme X-250, Go-Ped I-Ped and X-Treme X-360.